Scholarly interest in the history of crime has grown dramatically in recent years and, because scholars associated with this work have relied on a broad social definition of crime which includes acts that are against the law as well as acts of social banditry and political rebellion, crime history has become a major aspect not only of social history, but also of cultural as well as legal studies. This collection explores how the history of crime provides a way to study time, place and culture. Adopting an international and interdisciplinary perspective to investigate the historical discourses of crime in Europe and the United States from the sixteenth to the late twentieth century, these original works provide new approaches to understanding the meaning of crime in modern western culture and underscore the new importance given to crime and criminal events in historical studies. Written by both well-known historians and younger scholars from across the globe, the essays reveal that there are important continuities in the history of crime and its representations in modern culture, despite particularities of time and place. Contents: Crime And The Construction Of Historical Narrative: Does the representation fit the crime? 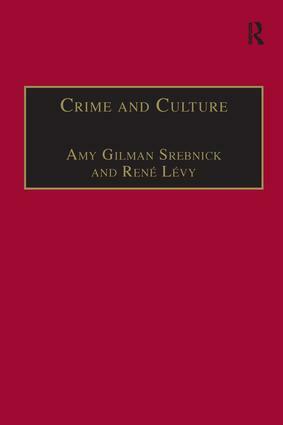 : Some thoughts on writing crime history as cultural text, Amy Gilman Srebnick. Discourse And Narrative In The History Of Criminology: Criminological language and prose from the late eighteenth to the early twentieth centuries, Peter Becker; Science and narrative in Italian criminology, 1880-1920, Mary Gibson; 'Robert Heindl's Berufsverbrecher:' Police perceptions of crime and criminals and structures of crime control in Germany during the first half of the twentieth century, Herbert Reinke. The Reconstruction Of Events In Police and Criminal Justice History: Narratives of crime, historical interpretation and the course of human events: The Becker case and American progressivism, Allen Steinberg; Sergeant Goddard: the story of a rotten apple, or a diseased orchard?, Clive Emsley; Competing memories: resistance, collaboration and the purge of the French police after World War II, Jean-Marc Berlière; Facts and fiction in police illegalisms: the case of controlled deliveries of drugs in France in the early 1990s, René Lévy. Representations Of Crimes And Criminals: Private crimes and public executions: discourses on guilt in the ArrÃªts Criminels of the eighteenth-century parliament of Paris, Pascal Bastien; Rebels or bandits? The representations of the 'Peasants' War' in Belgian departments under French rule (1798), Xavier Rousseaux; The multiple lives of the Hungarian highwayman, MÃ³nika MÃ¡tay and GyÃ¶rgy Csepeli; From Old Cap Collier to Nick Carter: Or, images of crime and criminal justice in American dime novel detective stories 1880-1920, Wilbur R. Miller; Index. Amy Gilman Srebnick is Doctor and Professor of History at Montclair State University in New Jersey, USA. Dr Rene Levy is Director of Research at the Centre National de la Recherche Scientifique, France. This series seeks to publish original cutting-edge contributions to the fields of criminology, criminal justice and penology. Volumes include discussions of Foucault and 'governmentality'; critical criminology; victims and criminal justice; corporate crime; comparative criminology and women's prisons.